Eating Red Meat makes you die sooner! Oh noes! Throw out all your steak! (And send it to me!) The Washington Post ran a story earlier this month with this same tired headline we’ve been hearing since the 80’s. I remember it even being a plot point on an early episode of The Cosby Show. All that terrible Saturated Fat just clogs up the ole arteries and you are just one fatty steak with butter away from a massive coronary. But in the interest of seeing exactly how these headlines keep cropping up and how you can educate yourself with how these unscientific Scientific Reports keep getting disseminated, let’s break this down. The first thing you need to know is the study this news article is based on. 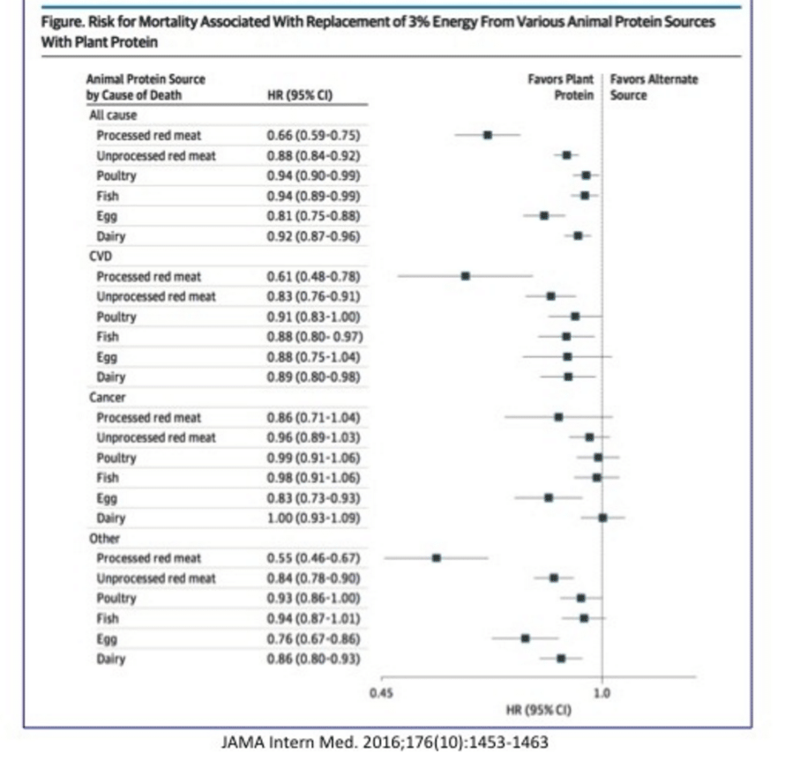 It is Association of Animal and Plant Protein Intake With All-Cause and Cause-Specific Mortality that was published in JAMA and is a large Cohort study. Any time you see the words “Cohort Study” your internal alarm bells should already be ringing because this means that this isn’t a clinical study done with a control group and tightly scrutinized but is typically a survey or questionaire filled out by a large group of people and looked at for correlations in the data. In this case they took data from the Nurses’ Health Study and the Health Professionals Follow-up Study where they ask numerous health professionals several questions pertaining to different health risks like smoking, physical activity and medications. Then every 4 years they are asked questions about their diet and are asked to remember what they ate over the last 4 years. Now go back and read that last sentence again. Can you remember how often you ate junk food in the last 4 years? Or vegetables? Or meat? I can barely remember what I ate yesterday. Also, if you are health professional, wouldn’t you tend to fudge your answers a bit to make you seem healthier than what you are? So now let’s look at the results. 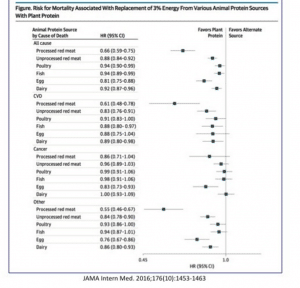 The study says that for every 10% increase in animal protein to your diet, your risk of dying increases 2% (Not statistically significant) and your risk of dying from heart disease increases 8% (Barely statistically significant). In other words, if you eat more meat, you won’t die any faster but if you do die, chances are increased it will be from cardiovascular disease. So what does this tell us about what happens if you eat more vegetable protein? Well, your risk of death is statistically the same but the chances of it being from a heart attack are decreased. In other words, if you eat more veggies, you will die at the same rate as the meat eater but from something different. So who cares if it is a heart attack or something else that gets you? And keep in mind that these are the results AFTER the “adjustment” that forced these number to say this. So why tout such a misleading study in this way? 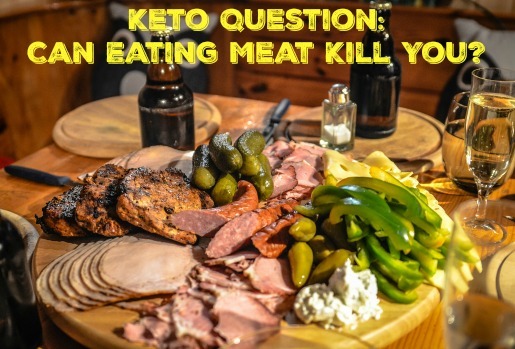 Because it already fits in the existing “Meat Kills” narrative and is sure to get lots of press like the Washington Post article that inspired this post. After all, if you are someone that invested all this time and money into this study, you need to justify the expense and nothing does that like press. Oh sure, the public is misled and lives are affected, but really cares about all that. So now that we’ve said why you shouldn’t be scared of this study, let’s take a look at one piece of data that actually is a bit of good news. I know that table is a bit blurry but what it says is important. It is breaking down the TYPES of meat that cause the different types of death like CVD, Cancer, etc. Can you see the outlier? Can you see the one type of meat that is most deadly? 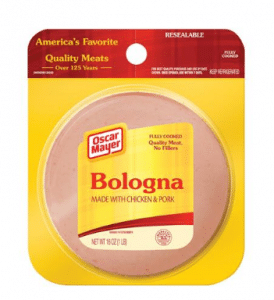 Yep, it’s processed meats like bologna, sausage, etc. Just to help us understand the difference between a steak and bologna, let’s take a look at the ingredients list for standard Oscar Mayer Bologna. Nothing Says Healthy Like “Mechanically Separated Chicken”. Yum! 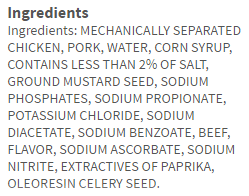 The first ingredient is Mechanically Separated Chicken. What is that? Well after all the usable chicken is removed from the carcass, the chickens are run through a machine that grinds them up and then they are spun to separate the “meat” from the bones. That meat is stuff like internal organs, eyeballs, flecks of skin, who knows what all else but it barely qualifies as meat. Then the magic ingredient is added to that slurry, Corn Syrup. Yep, not only are you getting “meat” but you are getting it sweetened with sugar. Then take a look at all those other chemicals and flavorings added to it. Who knows what those chemicals do to you? Well I guess we do know based on this study, they kill you. PREVIOUS POST Previous post: 3/29 Weightloss Wednesday: Another Step Closer To My Goal!